Note: The distances mentioned on the itinerary are approximate travelling in coach per day. Limerick: Burnatty Castle from outside. This tour starts from London and finishes in London only. Pick up points are London North, London North West and London West only. Pickup times are subject to change. Early morning meet your Tour Director and board your coach for a leisurely drive through the Oxfordshire countryside to the Welsh border. You will pass the Snowdonia National Park to Holyhead where you will board the ferry and cross the Irish Sea. After disembarking you drive to Ireland's capital, Dublin. On arrival enjoy an orientation tour showing you the major sites such as St Patrick’s Cathedral which is the largest Protestant church, this cathedral, stands on the oldest Christian site in Dublin. Continuing on you visit Trinity College which is the oldest university in the country and was founded in 1592 by Queen Elizabeth I. Later you see Dublin Castle (from outside), as well as Phoenix Park which was formed in 1662. The rest of the day is at leisure. If time permits why not take a trip and try the real Guinness tonight? 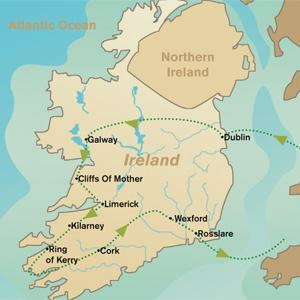 After breakfast, you travel from one side of the Irish coast to the other crossing the mighty Shannon river. You drive past the quaint towns of Ballinasloe and Athlone to make way to the city of Galway where you will visit the famous Galway Cathedral before driving alongside the panoramic Bay. Next you will be able to admire the Cliffs of Moher these spectacular sandstone and shale cliffs run for eight kilometres and rear up to 200m out of the sea. Later drive through the Emerald Isle’s wonderful scenery taking you to the third largest city of Limerick. Here you will have the opportunity to visit Burnatty Castle (from outside) which was built in 1460 by the Mac Namara clan. Today commence by driving to County of Kerry where you will visit the town of Killarney and its beautiful surrounding lakes. Later in the afternoon experience Ireland’s most scenic coastal drive, around the‘Ring Of Kerry’ County Kerry’s largest peninsula. Its varied landscape is truly a photographer’s delight. On your journey you will also see the town of Killorglin (famous for the Puck Fair), Daniel O’Connell’s Cahirciveen, the fishing village of Waterville, the Black Valley and Moll’s Gap. Finally you arrive into the city of Waterford for the night. After an early breakfast, drive to Rosslare Harbour where you will board your ferry to Pembroke in Wales. After disembarking, you proceed towards London and will terminate your tour at your original pick – up – point.